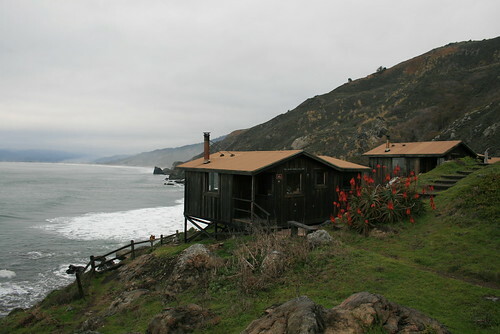 My sister, Nicole, and her husband, Marcel, came for a quick visit this past week and as a special treat, we reserved one of the Steep Ravine Environmental Camp cabins on the ocean! They are part of Mt. Tamalpais State Park, which is located just north of San Fransisco in Marin county. The cabin was a bit pricey ($100/night) but we figured it would be a once-in-a-lifetime kind of experience, and where else can you get a beautiful cabin just a stone's throw away from the ocean for $100? Split between four people, it wasn't bad. We reserved it on recreation.gov. When we reserved the cabins, we got an e-mail with the code to the gate (the entrance to the environmental camp is locked from the highway) and the combo for the cabin. You must make a reservation to get in - its not a drive-in kind of campground. We reserved cabin #4, which was the southern most cabin, and we had an awesome view of the waves crashing onto the rocky shore. Before I reserved the cabin, I tried researching about them on the internet, but couldn't find too much info on them, so I will write as much as I can about our experience. Our cabin, called Rocky Point, #4. Inside the cabin, we found a plaque which told the history of the cabins. They were built in the 1930s by some man (I forgot who). He built 13 of them and then leased them out to private individuals. In the 60s or 70s, the state park took over the land, and the issue with what to do about the cabins became controversial. They were abandoned by the park service, and most of them became dilapidated. Three of them eventually had to be torn down because they were in bad shape. In the 80s, the park finally began to restore them, and in 1984, they began renting them out to people to stay in (like us!). 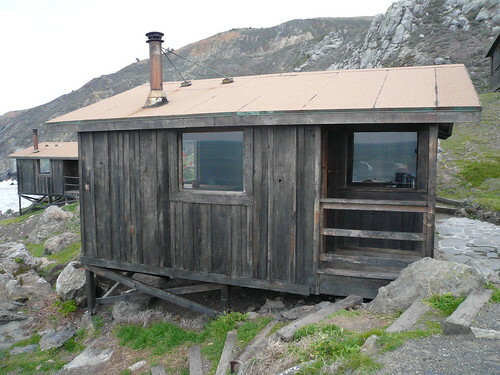 There are 10 cabins which remain in use, plus a fancy campground host cabin (it looks more like a small house). There is no running water or electricity. It is completely primitive. Inside the cabins are wooden sleeping platforms and a wood stove, which you use for heating. 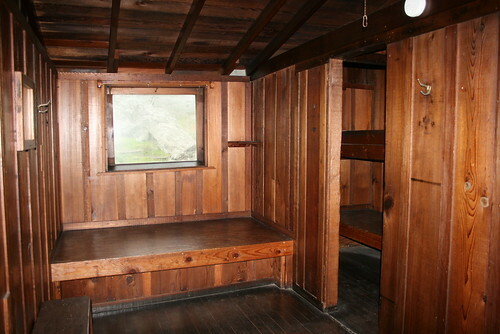 The smaller of the two sleeping platforms in the 'bedroom.' You can also see the bunk beds to the right. We came with a bunch of our own firewood (although they sell large bundles for a reasonable price near the campground host). We also had a big Coleman lantern to light up the cabin at night. We brought all of our camping stuff, basically, like sleeping bags, a small stove, and the mess kit. 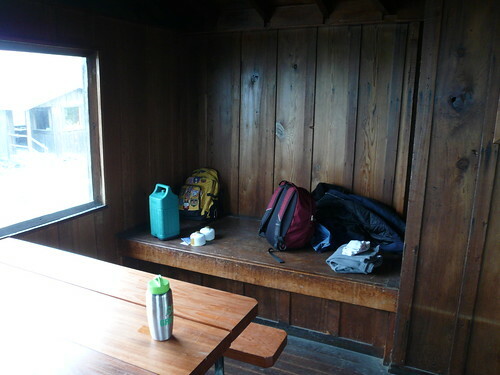 The table and bench/sleeping platform in the main room of the cabin. We got there in the afternoon, so we had time for a small hike before it got dark. There was a nice trail along the coast, and also into the campground part of the environmental camp. We saw calla lilies blooming and other coastal flowers in bloom. There were hummingbirds, herons, and pelicans all over! After that we ended up going back into the cabin to start a fire in the wood stove and toast some pine cones we picked up so that we could eat the pine nuts. We ended up over-toasting them, because they came out a little burnt. 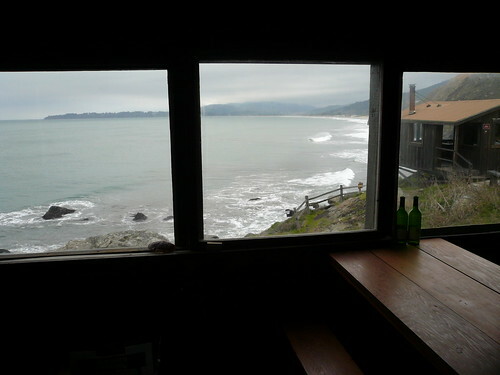 Ocean view from inside the cabin (#4). We brought plenty of wine and chips, chili, avocados for dip, and cheese. That was our dinner. We could hear the waves crashing into the shore below us all evening and all night. It was neat! Although it was cloudy, it didn't rain. We had a light mist overnight, but we were sleeping anyways. The next morning, we woke up early so that we could go check out the tidepools near the cabin. 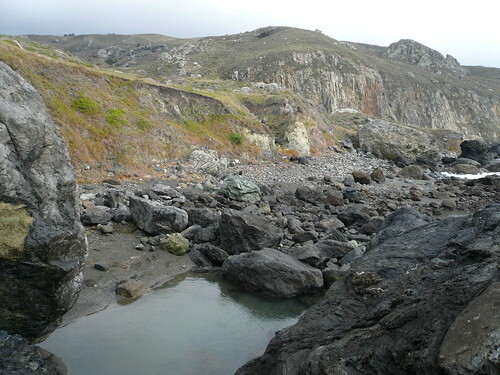 Hiking north, we found a rocky inlet where we saw a bunch of hermit crabs in their shells, walking around. 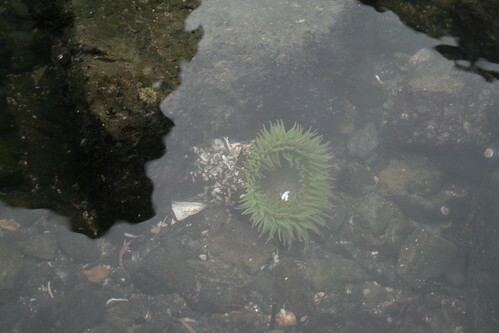 Then we began to notice bright green sea anemones, and even brown and orange starfish! We picked up some dried kelp, and tried poking the starfish to see if they would move, but they were really hard and stiff, and they didn't even budge. They were just stuck to their rock. 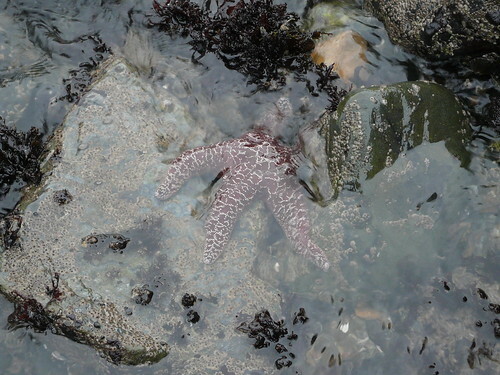 A brown-ish starfish at the tidepools. 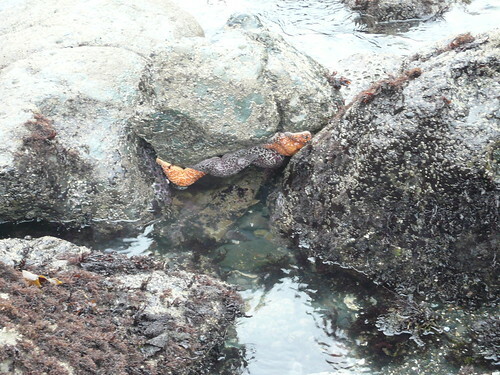 Two orange and two brown starfish clinging under the rocks. On our way back, the sun came out a little bit, and we saw a rainbow! But it seemed like rain was coming our way. After we got back to our cabin, it was sadly time to go already, since check-out was at noon. So we packed up our things and headed to the car. We drove home along the coast on Hwy 1. 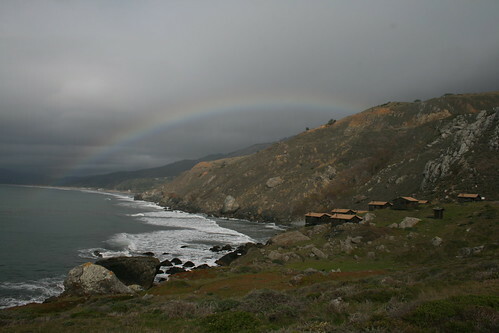 The Steep Ravine cabins and a rainbow. Nice! Thanks for the informative post. Very helpful. The landowner was William Kent. Your post was helpful to know what to expect (and bring, and look for during hikes). Thank you!